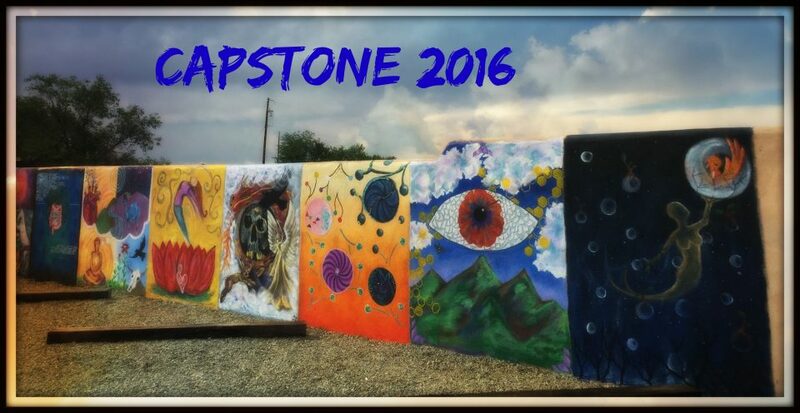 Art Therapy students finish their work here by completing a Capstone Project along with their other graduation requirements. We don’t require a thesis because we believe that students should finish an experiential program, experientially! These projects can include artwork, performance art, projects with clients, and social action events. These projects are designed to enhance, compliment, or reflect upon the internship experiences. Capstone Presentation Evenings – These lively evenings give our graduating interns an opportunity to share their internship journeys with family, friends and the college community. Watch videos here. Capstone Class – We offer this course as a way to learn about graduation requirements and to actually experience the creation of a group project. That’s where the pictures of murals and other group artwork come from.